We had heard about people bringing along their kids’ friends on their family vacations, but I never thought we would actually be doing it ourselves one day. 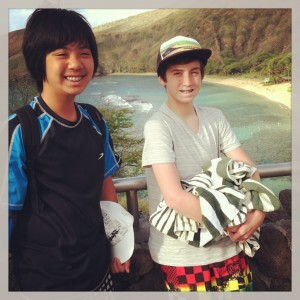 Then this summer, I took my son Joshua’s best friend Sam with us to Hawaii. Lest you think that that is over-the-top decadent and that I should have stuck to low-cost options such as going camping at the nearby campground, let me explain. I had some work to do in Hawaii mid-August, just before Josh started his sophomore year in high school but after Meg had already started her year-round middle school. I could’ve either left both kids at home with David or taken Josh with me. I let that thought sink in for a moment — just me and Josh in paradise. As much as I have a pretty good relationship with my teenage son, I just didn’t think he would be overjoyed with the prospect of hanging out with Mother for five days in Hawaii. In fact, I knew he would be spending an inordinate amount of time indoors playing online games with Sam in Texas, which he could very well do back home in Southern California…sans the airfare. So, I got a great idea: Why not bring Sam along with us to Hawaii? We told Sam’s parents that if they could fly him out from Texas to California, then we would take care of the rest. “The rest” meant using my airline miles for his flight from LAX to Honolulu. It also meant him staying with us in our two-bedroom timeshare unit which we were going to rent anyhow and is plenty big for the three of us. Sam’s overjoyed parents gave us some cash for his meals and spending money, but we happily paid for some of the fun activities such as the fabulous luau in Waikiki and snorkeling in Hanauma Bay. We had an unforgettable time! I didn’t feel badly about leaving the boys alone at the resort while I took care of business, because they are pretty independent at 15. They walked to the nearby IHOP for their breakfasts, and they hung out at the pool or the beach. I gave them permission and access to room-charge foods and activities, although they showed much restraint in exercising this privilege. I was quite impressed. Sam must be a good influence on Josh. When our kids were very young, we brought along baby sitters or hired them at the destination on our vacations. We paid all of their expenses and then some for watching our kids. I figured Sam was Josh’s “sitter” on this vacation — we probably should have paid him for taking care of our son! 1. Discuss the expenses involved with the other parents before embarking on such a trip. Some parents want to make sure they pay for all of the expenses, while others are only able to chip in some spending money. Be prepared to pay for 100% unless otherwise mutually decided upon. 2. Make sure your child is mature enough and responsible enough to accept this invitation. Spending five days on vacation with someone is different from an afternoon play date. The more you can train your child for independence ahead of time, the more fun the excursion is going to be for all. Sam was responsible, thoughtful, fun, and just assertive enough for all of us to enjoy our vacation together. We would take him again in a heartbeat. 3. Keep communicating with their parents throughout the trip. With facebook, Instagram, email, and texts, it was easy for us to keep updating Sam’s parents from Hawai with fun photos. I’m sure that his parents were pleased to see their son having fun in paradise! Have you ever taken a friend along on vacation? How did it work out for you? Share with us here! My life was crazy busy when my kids were very young. Working out was the last thing on my mind during those days when I was chasing a toddler around the house while nursing a newborn (and yes, by my second child I had perfected the art of nursing while standing, walking, cooking, shopping–you name it). I hardly had time to finish any of my meals before I had to clean up a spill or grab an escapee from a high chair, and I was routinely awake for more than 20 hours a day. I was always exhausted and haggard. Although I was at my lowest weight since high school, I was not in much of a shape and lacked muscle tone. My stomach still jiggled like jello. I looked like a shrunken version of my shriveled, postpartum self, somewhat resembling a prune. It was a far cry from my running days which stretched from my high school cross country team well into adulthood. I loved training, racing, and occasionally winning, back in my prime. Running was so freeing. Fast forward a few decades, and I found myself pushing two babies in a double jogger, vainly bribing them with cheerios to stay in their seats for at least one city block so I could somewhat get my heart rate up. Running became anything BUT freeing! However, running without the kids meant I had to hire a sitter or wait until David got home, and then I would be beset with guilt about leaving the kids for my 30-minute run. So, I just basically gave up on exercising altogether. That’s it, I said. I’m going to start going to the gym! I began attending the local 24 Hour Fitness club, taking full advantage of the wonderful child care program they offered onsite. I stopped feeling guilty about working out, because I was there with the kids, not away from them. Before long, I was going to fitness classes and moving with music which, I discovered in my middle age, I totally enjoy. I regret having made fun in the past of “those gym rats” who weren’t exercise purists like us runners. But no matter. I was no longer exercising to win; I was exercising just to survive. I needed to be strong for the kids, and I wanted to live long, healthy lives for their sake. And I had to stop feeling guilty about doing so. 1. Just do it! Don’t feel guilty about taking care of yourself. The kids need you, and you will be in so much better mood after a workout. 2. Do whatever you enjoy. If you’re able to go out for a run, and that’s your favorite form of exercise, then go for it. If you like to dance in the living room, walk with a stroller, take a class, or play tennis, choose whatever works for you. Set yourself up for success, not failure. 3. Schedule your workouts ahead of time. If you don’t have it in your calendar like any other appointment, you probably won’t make it. 4. Work out with a group. I’ve met some great friends through these classes, and these people keep me accountable. We text and check up on each other! 5. Do it for your health, not vanity. We all still have stretch marks and permanent pregnancy flabs, but we aren’t trying to win a beauty contest. We’re here to get strong. My kids no longer need child care, but I continue working out at the gym. And I don’t feel guilty anymore about that, either! Do you have guilt about exercising and taking time for yourself? Tell me about it!